if you can’t share no one gets any is an exhibition by Cinenova that took place at LUX, Waterlow Park. 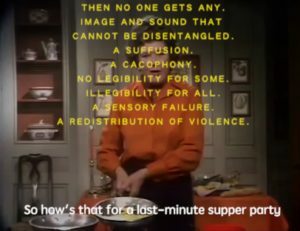 Cinenova invited artist Carolyn Lazard and the worker collective Collective Text to share the space of this exhibition to present work which addresses some of the barriers to the access of film and video in its production, distribution and exhibition. Alongside Lazard’s video installation, Cinenova invited Collective Text, a Glasgow-based worker collective who share skills and expertise to deliver intersectional access projects, specialising in creative Captioning and Audio Description for art and experimental film, to begin a longer-term access project for the titles within the Cinenova collection. Collective Text work in consultation with D/deaf & Hard of Hearing, Blind & Visually Impaired and Disabled artists and audiences. Collective Text worked with the following three films from the Cinenova Collection, that speak to issues around access, disability justice, and/or translation: All In Your Head by Jo Pearson, Double the Trouble, Twice the Fun by Pratihba Parmar (made with UK disability arts communities), and On The Threshold of Liberty by Heidi Tikka. Breakfast Opening 15 August at LUX, 9am–10.30am, for a special preview of the exhibition.